International Conference on Cyber Security (ICCS), on August 2nd-5th, at Fordham University in New York City. ICCS brings together global leaders in emerging cyber threat analysis, operations and enforcement. More than 700 IT, business and law enforcement professionals from over 50 countries will gather to discuss the most significant emerging cyber threats and how the security and law enforcement communities are responding to them. Eric Davis, Policy Manger and Director of Anti-Malvertising at Google will be giving a talk entitled: “Welcome to Malvertising” on Thursday, August 5th at 1:30 PM. “Malvertising” is the intersection of malware and advertising, where ads install malware or redirect users to sites that install malware. Eric will discuss how malvertising occurs over ad networks. He will discuss incident response, as well as available systems, tools and best practices for preventing malware in ads. If you'll be at the conference, please join us for our talk and stop by our booth to learn more about Google’s cyber security efforts as well as to learn more about how Google secures the data stored in our data centers. If you’re not going to be at the conference, you can find lots of information about cyber security in our Online Security Blog and information about the security of our data centers here. The Google Enterprise team is excited to be participating in the International Conference on Cyber Security (ICCS), on August 2nd-5th, at Fordham University in New York City. ICCS brings together global leaders in emerging cyber threat analysis, operations and enforcement. More than 700 IT, business and law enforcement professionals from over 50 countries will gather to discuss the most significant emerging cyber threats and how the security and law enforcement communities are responding to them. For this highlights post, we decided to focus on the top seach term for installable apps in the Marketplace: CRM. The lifeblood of all businesses, customers come in all shapes and sizes, and have different needs when interacting with businesses. We’re excited to have 13 different installable CRM apps in the Marketplace that can integrate with Google Apps in just a few clicks, each with a unique approach to helping you manage customer relationships. And because things are easier to digest when they come in 3’s, we’ve taken the liberty to present them in 3 different groups: CRM, Social CRM, and Project-based CRM. >> CRM: apps with a focus on internal processes around selling and serving customers. Rapportive searches the social web to find information which helps you establish rapport, grow your network, and be more productive. >> Project-based CRM: apps with a focus on project collaboration before and after the sale. Insightly lets you track leads, proposals, opportunities, projects and manage files, all through an easy to use interface. Solve360 CRM is a modern CRM that integrates features to manage client projects that is ideal for small teams in service based companies that need a flexible solution. Smartsheet pipeline gives you the core features of a CRM built into a familiar Google Spreadsheet format or with one of their sales, service, and marketing templates. If you’re looking to improve the way you manage and converse with prospects and customers, we encourage you to evaluate these apps. But also know we’re adding new apps to the Marketplace all the time, so check back if these don’t suit your needs. Editor's note: This is the latest in a series of posts on apps in the Google Apps Marketplace that have caught our eye here at Google. We’ll do this every few weeks or as we see things that we'd like to share. Look for the label "marketplace highlights" and subscribe to the series if you'd like to stay tuned. Businesses that use Google Apps not only get access to Google's applications, they also get easy access to some of the best business apps on the web through the Google Apps Marketplace. These Marketplace apps are easy to try and buy; once more, they integrate with Google Apps "out of the box," making it simpler for businesses to run more of their systems in the cloud. You can learn more about the Marketplace and watch a short video on how it works here. Editor’s Note: We’ve invited U.S. Navy Captain Douglas Wied to share the story of how Google Apps is being used to improve coordination in disaster relief efforts. Captain Wied currently leads the Navy’s effort to develop and foster Non-Classified data sharing among the U.S. and its many international partners focused on improving regional maritime security. The United States Navy’s Maritime Domain Awareness program focuses on improving maritime security around the world. As part of this initiative, the U.S. collaborates with international governments and non-governmental organizations (NGOs) to increase maritime security capabilities in different regions in order to prevent threats like piracy and terrorism, as well as to respond to natural disasters. Sharing information is critical to maritime security. And most of this information is public – or sensitive but unclassified, as the government calls it. In summer 2008, we began InRelief to improve our collaboration capabilities using Google Apps. InRelief supports the Navy’s humanitarian assistance and disaster relief mission. We use email, chat, shared documents, calendars, sites, and other Google applications to support our information sharing needs. Previously, on U.S. Navy ships, the unclassified network was a U.S. network only, so NGOs or foreign governments could not access it. We set up a Non-Classified Enclave (NCE) as a way to give our partners access. The NCE is a network of virtualized servers located in Miami, Florida that provide secure connectivity. InRelief is basically a cloud-based implementation of NCE. Our team saw several advantages to building InRelief on Google Apps, including security, scalability, reliability, and other powerful features we didn’t have to build ourselves. As part of the military, gaining familiarity the security controls of Google Apps was of critical importance. Our security team met with Google’s team and went through in detail how Google implements security. We came away with the understanding that Google Apps is very secure. The fact we’re hosted on a FISMA-certified environment allows our team increased flexibility and assurance when collaborating and sharing unclassified but sensitive content and documents. In the event of a major crisis when we would need a lot of accounts for a short period of time, Google Apps lets us scale easily to as many users as necessary. We can turn them off again when we no longer need them. That’s a tremendous asset. It would be really tough – and not cost-effective – to resource a system ourselves that could scale up and down like this. As for reliability, with Google Apps data is replicated in multiple data centers, so we can be assured we’ll have access to our data. Having a single point of failure is a constant challenge with other systems. Particularly when dealing with disasters, knowing the system will be available is a big plus. Some of the built-in features of Google Apps were critical to our needs. For example, real-time collaborative editing of documents, spreadsheets and presentations supports crisis response planning efforts using multiple personnel who are geographically dispersed. Also, real-time translation in chat can be extremely helpful when we’re trying to coordinate efforts with a coalition of people who speak multiple languages. Another issue we are always concerned about is the training requirements new tools impose on our users. With InRelief, we can give an account to a foreign government representative or NGO and it doesn’t take much time for them to get started. Earlier this year, we put Google Apps to test in coordinating a response to the Haiti earthquake. When the Haiti effort kicked off, our team was dispersed. We used the Google collaboration tools – email, chat and shared documents – to get things moving. Even the remote team members could review and contribute to the team’s work. Half the people in the group hadn’t used Apps before our efforts got underway – they just did it, with no learning curve. Our team is currently using the same capabilities to support relief efforts for the Gulf of Mexico oil spill disaster. Finally, the concern for developing cost-effective solutions that maximize the benefits of tax dollars spent, our overall costs were hundreds of thousands versus millions of dollars; a significant savings when compared to what we spend to host traditional stovepipe type systems requiring network connectivity, software, hardware, system administrators, information assurance testing, and certification & accreditation. With InRelief.org, we have a collaborative environment easily accessible with a secure and reliable infrastructure that allows us to respond rapidly to crisis. our intent to create a Google Apps environment dedicated to our government customers, and to complete United States government security certification for Google Apps. Today, we’re delivering on both. Today, we’re pleased to introduce a new edition of Google Apps designed specifically for the needs of U.S. government entities. It’s called – appropriately enough – Google Apps for Government. This new edition is available now to federal, state and local governments in the United States. Google Apps is also the first suite of cloud computing applications to receive Federal Information Security Management Act (FISMA) certification from the U.S. government. With this federal government certification of our security controls, government agencies can use our cloud services with confidence. A wide range of U.S. government customers are already taking advantage of Google Apps, from the U.S. Department of Energy’s Berkeley Lab to the U.S. Navy’s InRelief program, to the City of Los Angeles, to smaller governments across the country like Panama City, Florida and the City of Wooster, Ohio. You can learn more about how U.S. Government customers can benefit from this new edition in today’s Official Google Blog post. Last September, we announced our intent to create a Google Apps environment dedicated to our government customers, and to complete United States government security certification for Google Apps. Today, we’re delivering on both. Today’s guest author is Dr. Rosio Alvarez, Chief Information Officer at the Lawrence Berkeley National Laboratory. Dr. Alvarez serves the computational needs of scientists that carry out over $0.7B of sponsored research in quantitative biology; nanoscience; new energy systems and environmental solutions; and the use of integrated computing as a tool for discovery. She is also overseeing Berkeley Lab’s move to Google Apps. Ernest Lawrence, the Nobel Prize winning physicist, is often credited as being the father of “team science.” He understood that some of the most important and difficult problems in science required bringing together experts from across disciplines to work on experiments that they couldn’t possibly execute individually. That legacy is the foundation of work at Berkeley Lab. Today, we’re excited to be bringing the next generation of tools to support team science to the Laboratory, including Google Apps. Berkeley Lab is a member of the National Laboratory system supported by the U.S. Department of Energy through its Office of Science. It is managed by the University of California (UC) and is conducts unclassified research across a wide range of scientific disciplines. Berkeley Lab employs approximately 4,000 scientists, engineers, support staff and students. Eleven Berkeley Lab researchers have won the Nobel Prize. Fifty-seven Lab scientists are members of the National Academy of Sciences (NAS), one of the highest honors for a scientist in the United States. Collaboration It provides new tools and platforms for improving scientific collaboration, including real-time document sharing and support for easily including collaborators from around the world as full participants in our work. Berkeley Lab is in the midst of the first production rollout of Google Apps in the Department of Energy. We have moved over 4,000 people to the Google Mail service to date and an expected total of 5,000 accounts by the end of summer 2010. We have already rolled out Google Docs and Google Sites Lab-wide to improve collaboration capabilities for our staff. A transition to Google Calendar is planned in the coming months, as well. It’s been really gratifying to watch the adoption of Google Sites and Docs at the Lab. These two applications extend the reach of the Lab's existing collaboration systems by offering new features and easier inclusion of external collaborators. Smaller research projects with a few dozen collaborators often struggle with building the infrastructure to effectively share information; Google Apps makes it easy for them to deploy the services they need with no help from IT folks. Since we’ve integrated Google Apps with the Lab's Identity Management System, our users have a seamless experience. And all our users benefit from the extensive resources that Google has dedicated to keeping the Google Apps system -- and our data -- secure. The Lab expects to realize financial savings as a result of the transition. The final numbers are not available yet, but the estimates range in the area of $1.5M-$2M savings over the next five years in hardware, software and labor costs. Cost avoidance, increased functionality and resiliency were all important factors in the decision to migrate. Above all, we’re empowering our researchers to share, collaborate, and build teams like never before. We think Ernest Lawrence would be pleased. Editor’s note: Today’s guest author is Dr. Rosio Alvarez, Chief Information Officer at the Lawrence Berkeley National Laboratory. Dr. Alvarez serves the computational needs of scientists that carry out over $0.7B of sponsored research in quantitative biology; nanoscience; new energy systems and environmental solutions; and the use of integrated computing as a tool for discovery. She is also overseeing Berkeley Lab’s move to Google Apps. Editor's Note: Please join us for a webcast on Thursday where two Google Apps customers will share their approach to evaluating the security of Google's cloud computing solutions. MeadWestvaco (MWV), a $6.6 billion packaging company recently consolidated 10 email systems to Google Apps and Boise State University deployed Google Apps to 23,000 students, faculty, and staff. Chet Loveland, Global Information Security and Privacy Officer at MWV, holds 23 years of experience in the Information Technology industry and was formerly an Information Security Manager for Federal Reserve Information Technology. Brian Bolt, Lead Systems Engineer for Boise State's Office of Information Technology, holds 15 years of experience in the Information Technology industry, with an MBA from Boise State, where he has worked to emphasize the alignment of IT infrastructure and services to support the business needs of the university. Chet and Brian will be joined on the webcast by Eran Feigenbaum, Director of Security for Google Apps. Eran defines and implements security strategy for Google's suite of solutions for enterprises. Prior to joining Google in 2007, Eran was the US Chief Information Security Officer for PricewaterhouseCoopers (PwC). Learn what security and compliance questions to ask of a cloud computer provider and how Google addresses them on a live webcast on Thursday, July 22, 2010 at 2:00 p.m. EDT / 11:00 a.m. PDT / 6:00 p.m. GMT. Register today. Google Apps is one of the fastest growing cloud computing solutions available today. Not surprisingly, many organizations considering solutions like Google Apps have questions about security and compliance. When moving into the cloud, it is important to consider factors such as how the cloud provider fights spam, malware, and phishing, designs identity management systems for hosted web apps, and monitors its network for potential threats. Institutions must consider ways to protect intellectual property, compliance with regulations, and evaluating information about the cloud provider's data center and network infrastructure. At MWV, the main considerations were reducing IT costs and consolidating ten different email systems into one. At Boise State University, the primary concern was safeguarding student records and information. Despite differing priorities, most organizations today face common underlying security challenges and needs. Where is the best place for my applications and data? Why is security so tough? What are some of the issues with the traditional model? Can hosting data in the cloud be as secure or perhaps more secure, than in traditional environments? How can we maximize productivity by enabling people to work anytime, anywhere while minimizing the amount of data that is stored on distributed devices? How will the cloud provider affect costs and the reliability of security systems? How do we educate internal stakeholders and users on security and compliance issues to mitigate risks and help ensure adherence to best practices? And, ultimately, what are Google's practices and technologies that can help us maximize security while reducing costs? There are always plenty of questions and follow up discussions when considering the people, best practices, and technologies required to minimize security threats. There are also many lessons to learn from two Google Apps customers who have moved into the cloud – with security and compliance at the top of their lists to address. Learn more from experienced Google Apps customers and from Google's security chief for enterprise applications. Please join us for a lively discussion of the security and compliance considerations for moving into the cloud. , new data migration tools, SSL enforcement capabilities, more mobile device security controls, and the ability to tailor Google Apps with more than a hundred applications from the new Google Apps Marketplace. Today, we’re excited to announce one of the most highly requested features from administrators: user policy management. Now administrators can segment their users into organizational units and control which applications are enabled or disabled for each group. For example, a manufacturing firm might want to give their office workers access to Google Talk, but not their production line employees. Mayooran Rajan, CTO of Revevol Consulting, noted, "We work with businesses with 100 to 20,000 employees moving from on-premise solutions to Google Apps. The new user policy management feature helps us tailor Google Apps and provide businesses with granular control for each department within their company." 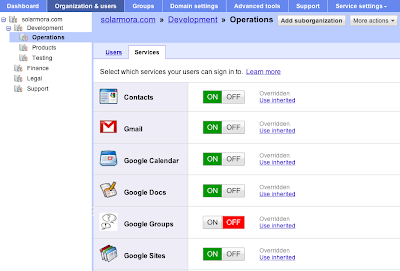 The ability to toggle services on or off for groups of users can also help customers transition to Google Apps from on-premise environments. For example, a business can enable just the collaboration tools like Google Docs and Google sites for users who haven’t yet moved off old on-premise messaging solutions. 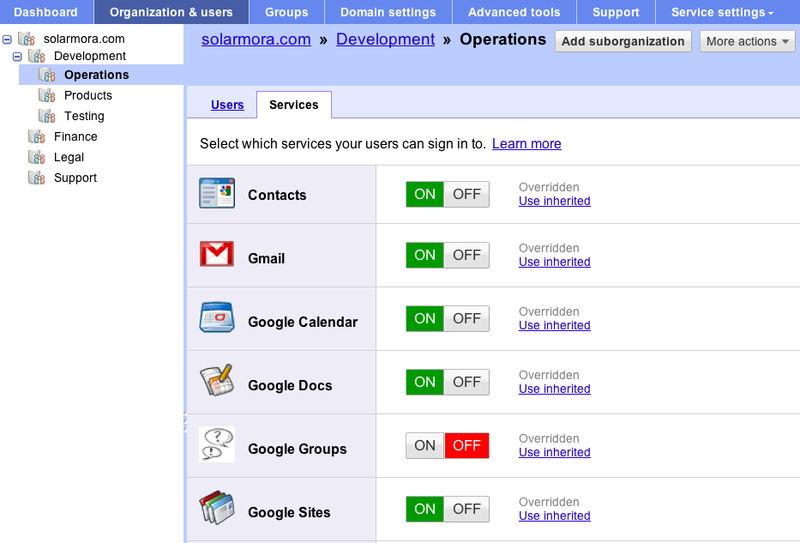 Administrators can manage these settings on the ‘Organizations & users’ tab in the ‘Next generation’ control panel. Alternatively, organizations can mirror their existing LDAP organizational schema using Google Apps Directory Sync or programmatically assign users to organizational units using the Google Apps Provisioning API. This feature is starting to roll out to Premier and Education edition users at no additional charge. To learn more about user policy management on Google Apps, please visit our Help Center documentation. In the past six months, we’ve released a series of new features giving administrators more controls to manage Google Apps within their organizations. Recent additions include multi-domain support, new data migration tools, SSL enforcement capabilities, more mobile device security controls, and the ability to tailor Google Apps with more than a hundred applications from the new Google Apps Marketplace. Today, we’re excited to announce one of the most highly requested features from administrators: user policy management. People should have the power to conduct searches from everywhere. This is why we provide users with numerous options beyond Google.com, such as typing in a search query directly in the address bar in Google Chrome, or through Google Toolbar, or Google Desktop. Ultimately, we are trying to provide as many options as possible to the end user. And by supporting OpenSearch, these options will increase as more platforms connect with OpenSearch. You can immediately download this feature on Enterprise Labs, or learn more about it in our technical documentation. Editor's Note: Continuing our “Going Google Everywhere” series, we’re pleased to welcome guest blogger Itamar Kubovy, Executive Director of Pilobolus, an innovative modern dance company that has gone Google. Itamar has been producing, writing and directing theater, dance and film since 1985 in Europe and the US. He joined Pilobolus at the beginning of 2004 as the company's first Executive Director. Last week, Pilobolus opened its 23rd summer season at the Joyce Theater in New York City, premiering new works and showcasing beloved classics. Learn more about other organizations that have gone Google on our community map. Pilobolus is a small company with 50 people strewn all over the world at any one time. We perform 200 shows in 30 or 40 different countries each year and have two different dance companies, so each week we have people moving around the world for performances and educational activities. There are a lot of logistics and moving parts that keepPilobolus going. We moved to Google Apps Premier Edition because we needed enterprise-level collaboration tools, without the high cost and maintenance. Most of us have iPhones and we keep track of 20 to 30 Google Calendars at a time. We also use Google Docs to manage our travel arrangements. Before moving to Google Apps, we would print out piles of travel itineraries that constantly kept changing. We estimate we are saving about 12,000 pieces of paper a year with Google Docs, if you consider that each dancer had about 10 pages of printed travel instructions for each venue! So much of the information we need to share is visual – rehearsals, performances, and such. It used to be difficult to share visual information when performances were kept on videotape. There was typically just one tape floating around, and if we wanted to share it with a choreographer or other dancers somewhere else, itwasn’t easy. Now, we upload all of our performances onto Google Video for business , part of the Google Apps Premier Edition suite. We have found that there is a lot more discussion happening, and we’ve been able to collaborate in real-time with choreographers and artists all around the world. In one instance, we worked with a couple in Tel Aviv who was helping us choreograph a new dance. The woman of the couple was due to have a baby any second and couldn’t travel. From a studio in Florida, we were able to collaborate together with the team in Tel Aviv using video streams of the rehearsal over Google Video. The power of Google Video for business for global collaboration is dramatically changing the way we work together and collaborate. It's so important in terms of communicating what went right or wrong, pinpointing a weak link in the performance, communicating changes to the choreography, or in asking questions of choreographers located in different places around the world. Video is a great collaboration tool when it comes to rich media – it’s the way we bring together a team that is spread all over the world.Google's tools have definitely made it easier to put our best foot forward! Social networks continue to be one of the most frequently spoofed domains for the purpose of spreading phishing scams and virus downloaders. These messages do not actually come from social networks but look similar to legitimate social networks messages. Such messages often contain links to external websites which contain malicious content and/or attempt to harvest user login information. The Postini Anti-Spam Engine is very good at detecting such messages, but users should always be cautious when handling messages from popular social networking sites. The shipping scam is a favorite of spammers. This quarter we saw a more wide spread outbreak of messages claiming to be from major shipping companies because spammers get a higher success rate with these type of scams. The subject for the message made it look like an invoice and the message body contained random text such as news stories that did not look particularly "spammy." Each message had an attached zip file that presumably was intended to contain some sort of virus payload; however, the data was corrupt and did not pose any actual threat. With the global economy continuing to lag, we have seen a continued upswing in “friend-in-need” phishing attempts, where hackers break into the email account of unsuspecting users and then hand-type a message to send to the victim’s email contacts. The most common message told a story of the person being mugged while traveling abroad and requesting money to be sent to them in order to help them get home. The hacker is preying on the generosity of the victims friends in the hopes that one or more of them will send money to them. These messages can be difficult for spam filters to identify since they are hand typed and not sent in bulk. It goes without saying, but be wary of emails requesting money – regardless of the sender. In response to these outbreaks, our engineers have released several updated filters to combat new spam waves. For more information on how Google’s security and archiving services can help your business stay safe and compliant, please visit www.google.com/postini. Editor's note: The spam data cited in this post is drawn from the network of Google email security and archiving services, powered by Postini, which processes more than 3 billion email messages per day in the course of providing email security to more than 50,000 businesses and 18 million business users. Spam and virus volumes this year have continued their upward trend. Q2’10 has seen a sharp 16% increase in spam volume over Q1’10. Virus traffic has moderately increased 3% increase this quarter, however Q2’10 virus was 260% higher than Q2’09. These trends tell us that the spammers are still extremely active, and their botnets produce high levels of spam and virus traffic. Spam volume shot up 16% from Q1’10 to Q2’10. Overall, however spam levels are down 15% from Q2’09. Virus volume grew quickly at the beginning of the quarter, shooting up 90% from March to April, but then quickly dropped off. We saw only a modest 3% uptick from Q1’10 to Q2’10 at the aggregate level. Compared to Q2’09, this represents a 260% increase. One interesting trend we noticed is size of individual spam messages rising 35% from Q1’10. This points to the fact that spammers are sending more image-based spam, as well as viruses as attachments. Google Apps Marketplace today, joining the more than 150 installable apps made available to Google Apps domains in the Marketplace since March. Instead of spending today patching operating systems, we invite Google Apps users to explore these new applications which can deliver immediate business value to your organization. These apps, like all installable apps in the Marketplace, offer single sign-on with your existing Google Apps user accounts, so there are no new passwords to manage. Beyond single sign-on, many offer deeper data integration with Google Docs, Gmail, and Google Calendar to help users work more efficiently, regardless of which app they happen to be using to get their job done. Bantam Live is an easy CRM & team collaboration app to track contacts, prospects, deals and organize projects, tasks, and events. It Integrates with Google Apps and social networks to import/aggregate contacts. Etacts helps grow your relationships. The application and Gmail contextual gadget enable you to instantly find out who you talk to the most and who you’ve neglected. Organizer by OtherInbox helps cure email overload. It automatically organizes low priority email out of the way, leaving your Inbox much smaller so it's easy to find the important messages from real people. Aprigo NINJA for Google Docs provides advanced access management controls for Google Docs, giving organizations greater visibility and control over how documents are shared within and outside of the company. Gminutes is your one stop meeting minutes management solution for professionally executing meetings. All you have to do is create your meeting space, add relevant people to it and you are good to go. Meetingmix helps you run meetings. It allows you to easily create agendas, take minutes, and share with attendees. ReachPeople provides easy group alert notifications for critical communications. Now, schools and businesses can send one or thousands of mass notification messages via voice, SMS text, or email. SiteKreator is an online service that allows anyone to instantly design, build and publish elegant, fully-branded, and interactive business websites. TheDeadline is an intelligent Todo-Manager. The system makes collaboration very easy and helps users focus on the most important tasks and keep an overview of large sets of todos. If you’ve #gonegoogle, and tried the #appsmarketplace, let other users know what you recommend via Twitter or submit your suggestion for additional apps here. We’re excited to announce the launch of 10 new apps in the Google Apps Marketplace today, joining the more than 150 installable apps made available to Google Apps domains in the Marketplace since March. Instead of spending today patching operating systems, we invite Google Apps users to explore these new applications which can deliver immediate business value to your organization.